Two thousand five hundred years have passed since the time of parinirvana of Gautama Buddha. Throughout the centuries, ever since the introduction of Buddhism up to the present time, Arakanese professed Buddhism without break. The present-day Buddhism in Arakan is the Theravada Buddhism using the Pali canon of Tripitaka which are Vinaya (conduct), Sutta (Sermon) and Abhidhamma (a mixture of metaphysics, psychology and mind development) Pitakas. The Buddhist’s here worshipped caityas and stupas. They believed that one can acquire great merit by building and decorating them. The Buddha images are also worshipped after glorifying by conducting a ceremony called Anekasa, which is recitation by a number of monks surrounding the image. The people worshipped these caityas, stupas and Buddhas images by offering flowers, food, incense, light and prayers. They believed these acts to be meritorious. They believed in the idea of the transfer of merit. That is, by making gifts one can acquire religious merits and one can also transfer such merits to one’s near and dear ones or their welfare and happiness. By performing meritorious deeds like offering alms and the four necessaries to the sanghas and giving charities to the poor and the needy, and doing good deeds personally or in words or in thoughts, one gains merit and will go to devas abode after death. Whereas by doing evil deeds or getting involved in evil acts personally or in words or in thoughts, one falls into a downward state of existence, a state of suffering or even to the abyss of hell such as Rauruwa, Avici etc., after death. They believed in the three ways to salvation, i.e., the Arahatship, the Pratyekabuddhahood and the supreme Buddhahood. The lay people strived for Arahatship as the way to Nirvana. They accepted the idea that the universe is cyclic and that they live in a Buddha cycle called Bhadrakalpa and are expecting the coming of the fifth Buddha, Maitreya. There are many members of the Buddhist Order, that is, the monks (sangha) who wear yellow robes and strictly observe the Vinaya pitaka. They have given up all the worldly pleasure and lived a pure life striving to attain Nirvana. The lay people have noviciating ceremonies for boys who spend sometimes, usually a week or more, in a monastery under the guidance of a revered abbot to experience the life of the monkhood. During his stay in the monastery as a monk, the boy learns for himself the religion of his parents, the abbot guiding him of course. If he likes the life of a monk and wants to forego the worldly pleasures, he can become a monk for life. But he will be qualified for full membership of the Order only after attaining the age of twenty. If not, this ceremony can be taken as a preparation for adult life. In Arakan State, unlike Burma proper, the noviciating of a boy is done only when the boy reaches an age when he can understand and assimilate Buddha’s teaching. Especially during the period of Wasoe (Buddhist lent which falls during rainy season), people used to keep Sabbath taking five, eight, nine or ten precepts. People in more advance stage of piousness used to meditate to free themselves from ten “fetters”, i.e., Samyojana. Such are the beliefs and practices of present-day Buddhists of Arakan State. The same is true for the past centuries. To state very briefly, the historical periods of Arakan may be divided into the following dynasties. 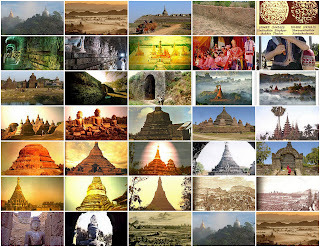 One can travel to Arakan and see for oneself numerous Caityas (pagodas), Stupas and innumerable Buddha images built and made by the kings of these dynasties. Especially the town of Mrauk_Oo (former Mrauk_Oo city), being the last of the Arakanese capitals, is rich in these religious edifices and images. From the inscriptions and palm-leaf manuscripts, we can find that the kings used to choose the way to Nirvana by desiring to become a Supreme Buddha, the first step of which is the Bodhisattvahood. In our literature, when a king died, he was not mentioned as dead, but mentioned as went to the abode of devas. We can read many descriptions of this kind in the Anandacandra inscription, inscribed about 729 A.D. Since Bodhisattva in advanced stage used to reside in the abode of devas, it is natural that the kings should go there after their death. As the king promised to look after the welfare of all the people in his dominion during the abhesika ceremony, it is only natural that he should not strive to attain Nirvana alone. He should also help his subjects attain Nirvana. So he should aim to become a Bodhisattva. I have shown in this book miniature stupas, miniature caityas, bronze bells, bronze lamps and many types of bronze Buddha images, crowned and uncrowned. These were obtained from the relic chambers of the old ruined caityas and stupas. They belong to the period of Dhanyawadi and Vesali. When Buddhism did first introduced into Arakan? And what type of Buddhism was that? According to tradition and our historical annals, Buddhism was introduced into Arakan during the life-time of Buddha himself. Keeping tradition part, let us search for concrete evidences which will give us at least the upper limit for the period of introduction and the type of Buddhism introduced. I have mentioned in Chapter IV that we have found one Fat Monk image with a line of inscription in Brahmi script used about the beginning of the Christian era. This Fat Monk, Saccakaparibajaka, was related to an incident in Buddha’s life. Images of Buddha were also found together with this image. As there were no inscriptions nor dates inscribed on them, it is difficult to assign them to the same period as the Fat Monk. Apart from this image, we can search for more concrete evidences. We may take the miniature stone stupas with Ye dharma verses on them, the stones with Ye dharma verses fallen out of the ruined stupas or caityas, and the inscription found on one of the Mahamuni sculptures as the solid evidence for dating the upper limit of the introduction of Buddhism in Arakan. The dating can be done palaeographically and these writings can be assigned to some time about the 4th or the 5th century A.D. I have explained the Ye dharma verse and mentioned that it reveals the cream of the teaching of the Buddha. See Chapter V. It is very clear that the people who made these stupas and who inscribed the Ye dharma verses for the posterity professed the type of Buddhism based on the teaching of the Buddha and not on the personality of the Buddha. Again, the word Mahasramana in the verse means the Great Monk. By using this word, it is clear that the Buddha was referred to as a Great Monk and not as a God. Again in Chapter XI we have seen a ceti dedicatory inscription from eighth century Vesali. The inscription mentioned one to purify his own mind to attain nirvana. The three impurities, lobha, dosa and moha should be discarded revealing that the Buddhism practiced at that time was based on the teachings of Buddha. Therefore, we can definitely say that the Buddhism that flourished during this period was not Tantric Buddhism nor the advanced Mahayana with plenty of Gods and Goddesses. We can infer that the Tantric Buddhism, which is an advanced state of Mahayana Buddhism, never flourished in Arakan. Even in India, this type of Buddhism became popular only after the 8th century A.D. According to scholars studying Indian Buddhist Iconography, the monks who professed Tantric Buddhism in Bengal fled to Nepal, instead of Arakan which was more easily accessible, during the Muslim invasion. This definitely proved that there was no ground for them to flourish in Arakan and the Arakanese never accepted the Tantric Buddhism. The Mahamuni sculptures are varied and many. If one does not study the Buddhism prevailing in the country at the period of making these sculptures, one may presume these to be the Gods and Goddesses of the Tantric Buddhism. That is why these sculptures are described in the last chapter of the book after discussing about the various aspects of Buddhism and the type of Buddhism flourishing in Arakan at that time. 1) Ali, S.M. “Arakan Rule in Chittagong (1550 – 1666 A.D)” JASP (1967) pp. 333 – 351. 2) Bapat, P.V. 2500 Years of Buddhism, New Delhi, 1976. 3) Basham, A.L. The Wonder that was India, Lodon, Fontana, 1967. 4) Benerji, R.D. Eastern Indian School of Mediaeval Sculpture, Delhi, 1933. 5) Bernot, L. Les Paysans Arakanais due Pakistan Orientale, 2 vols., Paris 1967. 6) Bhattacharrya, B. The Indian Buddhist Iconography, Calcutta, 1958. 7) Bhattasali, N.K. Iconography of Buddhist and Brahamanical Sculptures in the Dacca Museum, Dacca, 1929. 8) Buler, G. “Specimens of Jaina Sculpture from Mathura” E.I. II, p. 314. 9) Chan Htwan Oung “The Mahamuni Shrine in Arakan,” JBRS, II, (1912) pp. 262 – 265. 10) Coomaraswamy, A.K. “The Buddha’s Cuda, Hair, Usnisa and Crown”, JRAS (1928) pp. 815 – 840. 11) Dani, A.H. Indian Palaeography, Oxford, 1963. 12) Dani, A.H, “Mainamati Plates of the Chandras” Pakistan Archaeology, III (1969) pp. 22 – 55. 13) Doewai, Rakhaing Razawingri, (Burmese), Palm – leaf manuscript. 14) Forchhammer, E. Papers on Subjects Relating to the Archaeology of Burma: Arakan, Rangoon, 1891. 15) Foucher, A. The Beginnings of Buddhist Art, Paris, 1917. 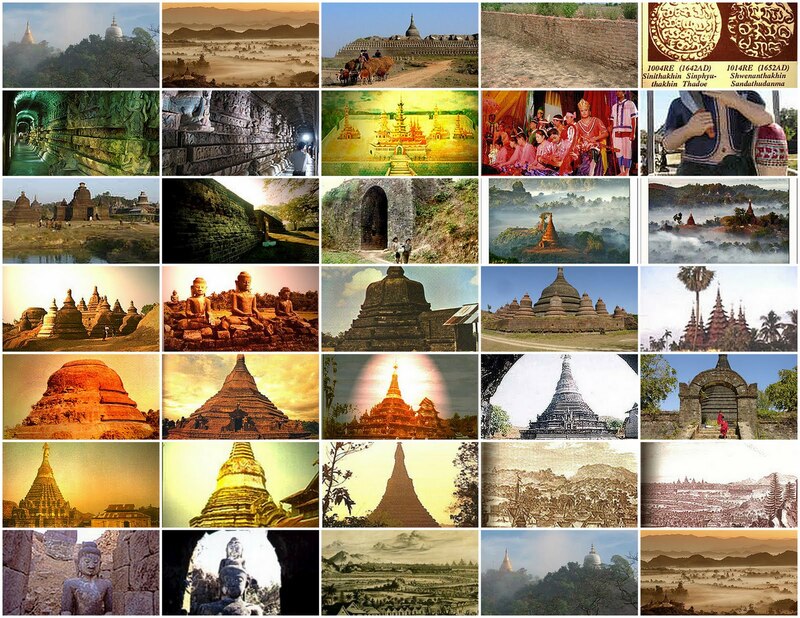 16) Gutman P. Ancient Arakan, Ph. D Thesis, Australian National University, 1976, Unpublished. 17) Hall, D.G.E. “Studies in Dutch Relations with Arakan,” JBRS, XXVI (1937) pp. 1 – 10. 18) Harvey, G.E. History of Burma, London, 1925. 19) Humphrey, C. Buddihism, London, Penguin Books, 1975. 20) Johnston, E.H. “Some Sanskrit Inscriptions of Arakan,” BSOAS XI (1944) pp. 375 – 385. 21) Kyeethelayhtat Sayadaw, Jinatthapakasani, 4 Vols, (Burmese), Rangoon, 1951. 22) Luce, G.H. Old Burma-Early Pagan, 3 Vols, New York, 1969. 23) Mai, U Rajawingri, (Burmese), Palm – leaf Manuscript. 24) Mya, U “A note on the Buddha’s Footprints in Burma”, ASI, (1930 – 34) pt. 2. pp. 320 – 331. 25) Nyanatiloka, The Word of the Buddha, Colombo, 1952. 26) Ojha, G.M. Bharatiya Pracina Lipi Mala, New Delhi, 1918. 27) Phayre, A.H. “An Account of Arakan” JASB, X (1841) pp. 679 – 711. 28) Phayre, A.H. “On the History of Arakan”, JASB, XIII (1844) pp. 23 – 52. 29) Ray, N. Sanskrit Buddhism in Burma, Calcutta, 1936. 30) San Shwe Bu, “The Legend of the Early Aryan Settlement of Arakan, JBRS, XI, 2, p.66. 31) San Shwe Bu , “The History of Arakan”, JBRS, XII, 3, p. 167. 32) San Shwe Bu, “The Story of Mahamuni”, JBRS, VI (1916) pp. 226 -229. 33) San Tha Aung Scripts of Arakan, 6th Century and before, (Burmese), Rangoon, 1974. 34) San Tha Aung, Anandacandra, King of 8th Century Vesali, Arakan, (Burmese), Rangoon, 1975. 36) Smith, V.A. The Early History of India, Oxford, 1924. 37) Sircar, D.C. “Inscriptians Copper-Plate Grant from Arakan”, EI, XXXVII (1957), pp. 103 -109. 38) Sircar, D.C. “Fragmentary Copper-Plate Grant from Arakan”, EI, XXXVII (1967), pp. 61 – 66. 39) Sivaramamurti, C. Indian Epigraphy and South Indian Scripts, Madras, 1952. 40) Thin Kyi Daw “Arakanese Capitals: A preliminary Survey of their Geographical Setting, JBRS, LIII (1970) pp. 1-14. BSOAS = Bulletin of the School of Oriental and African Studies, London. JASB = Journal of the Royal Asiatic Society of Bengal, Calcutta. JBRS = Journal of the Burma Research Society, Rangoon. JRAS = Journal of the Royal Asiatic Society of Great Britain and Ireland, London. JASP = Journal of the Asiatic Society, Pakistan.